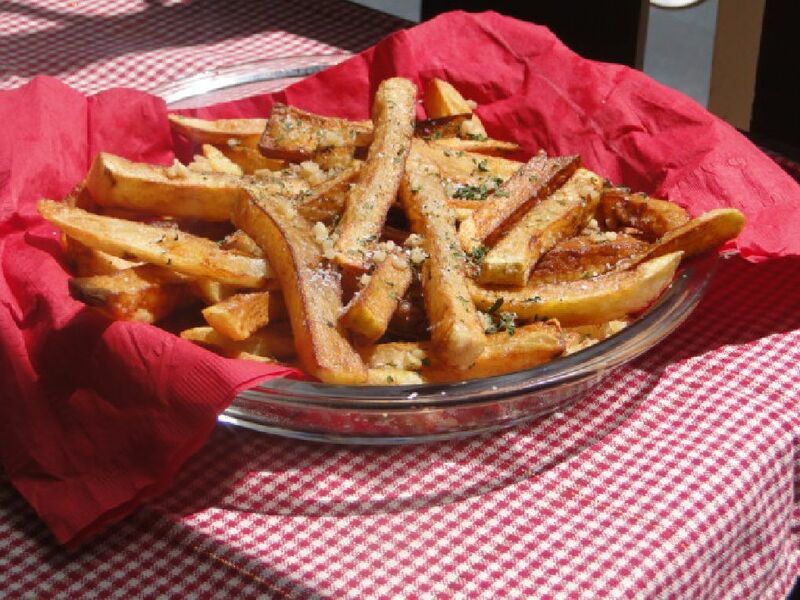 “Giants Garlic Fest” or Garlic Fries and Baseball at AT&T Park! What a hoot! When I first found out about the Garlic Festival to be held at AT&T Park I knew I had to be there. I mean how many blogs are out there about this very subject? And a book entitled “Garlic Fries and Baseball” no less. To be perfectly honest it wasn’t about the garlic fries so much ~ I’ve eaten plates full. “Herbie at home on my bookshelf”! 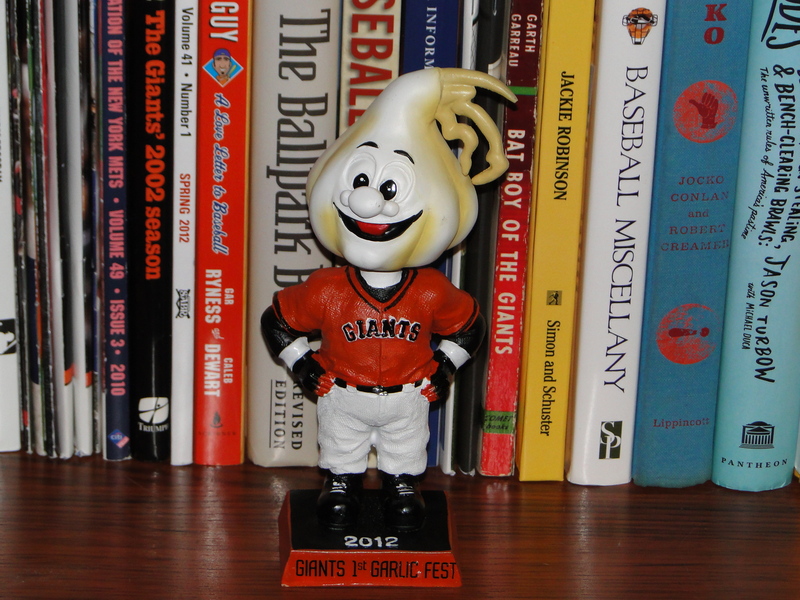 I’ve been to the Gilroy Garlic Festival many times and to tell you the truth, when I found out they were going to have “Herbie” the bobble head, I had to have one. So I dragged my dear husband to the ballpark today and we got in line at the Will Call, and again at the Main Gate and the food court and finally at the bobble head give-away table. And I got my bobble head. There’s something really special about being out in the warm sunshine, on the waterfront at AT&T Park, well any ballpark really, but especially at AT&T. We met some really nice people, talked a little baseball and talked a lot of garlic. Smiles were abundant and today the smell of that yummy garlic was everywhere. Garlic fries were the best of course, but the garlic bread and incredible sauce slathered all over the tender tasty pieces of calamari was to die for. I knew my husband would share his calamari with me (he thinks it tastes like rubber bands) and that I’d have to give up a little bread and fries in the trade, but it was okay. It was all good. I love this stuff. I understand they’re planning on making this an annual event. I sure hope so. We’ll definitely be back next year. We didn’t stay for the game; instead headed back on Caltrain around 5:30 and arrived home just in time for the first pitch on the telly. The first pitch this time turned out to be a home run for Cincinnati. 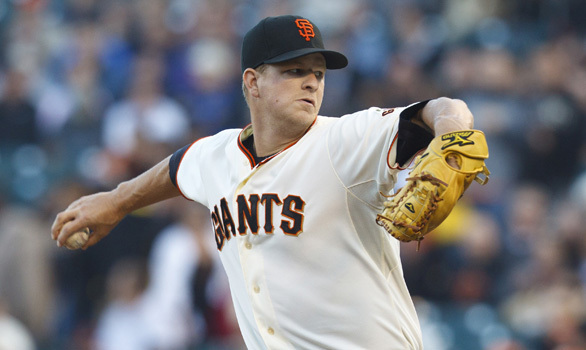 I was rather relieved for Matt Cain. The way I look at it ~ the prospect of a no-hitter, one-hitter, and perfect game were no longer issues and he could relax and enjoy the game with the rest of us. Final score was Cincinnati 5, Giants 1, but you know what? It was okay. After these past few weeks, the Giants have treated us to some really special moments and right now, at least for today, they’re standing alone in 1st place in the National League West. Life is really, really good. Don’t you just love it? Garlic fries and baseball I mean. 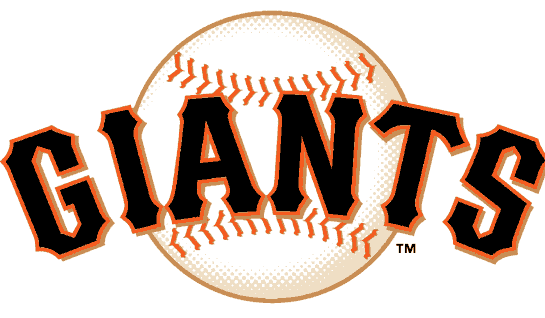 I’m gonna come out and say it, the 2012 San Francisco Giants just might be better than the 2010 team that won it all. Yep,I said it, better than the 2010 team. Why do I think so,you ask? This team just looks like it got much better this season after an injury plagued 2011 season which saw it’s main source of offensive firepower,Buster Posey, gone for the year. Once Posey left, so did the Giants chances to repeat. This year is another story. Posey has since returned and is having a great year and looks as healthy as he did before the injury last year. He may very well be the starting catcher for the National League in this year’s All-Star Game in Kansas City. I was in sync with this book from the moment I first began reading it. It was an easy read, which is exactly what I was in the mood for at the time. The book is about Juan Marichal, a young Pitcher from the Dominican Republic whose talents earn him a trip to the United States to try for a spot in the major leagues. The book offers a different perspective; each chapter begins with a professional analysis of Juan’s life during that chapter’s specific time period and ends with Juan telling his story, in his own words, to end the chapter. He writes as he talks. His English is that of someone who was born and raised in the Dominican Republic but has spent many years in the United States with his fellow Latinos and also with a wide variety of friends and teammates, speaking and writing with a bit of Latino character which I found endearing. He was very careful not to use curse words and was able to convey his message with some laughable moments to get his point across. But some of the stories he shared from his early days in this country were heartbreaking. Marichal talks in detail about the typical black-in-a-white country problems that his Latino teammates shared with him. He was able to overcome those civil rights issues because he could play baseball. He could play it better than the majority of the other ball players and he overcame the prejudice and intolerance because of that. He writes with great humor sharing stories about teammates, victories, defeats and the genuine homesickness he felt when he first left his country for the United States, his baseball career with the San Francisco Giants, the Hall of Fame and back home again. 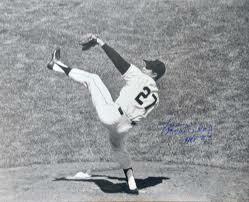 The one regret during his career was the fight he had with Johnny Roseboro in a Giants-Dodgers game on August 22, 1965. He writes painstakingly about the events that lead to the altercation, the remorse he felt for years afterwards, and the friendship that developed between the two men until Roseboro’s death in 2002. There’s much more in the book of course. The one thing Marichal is most proud of besides his baseball career is his family and we’re allowed to meet them, his beautiful wife and children, through his stories and photographs . I find Juan Marichal to be one of the most interesting baseball players I’ve studied, maybe because of that crazy baseball duel he pitched nearly 50 years ago against Warren Spahn. He writes about that game with great enthusiasm, obviously one of his favorite moments in baseball. But he’s also one of my favorite athletes, probably because he’s a true gentleman and he remains truly humble after all the honor and accolades that have been given him. And after reading the book I came away with the feeling he deserved each and every one of them ~ the honor and accolades I mean. I enjoyed this book very much. I’ve heard others asked who they’d most like to have a long conversation with. 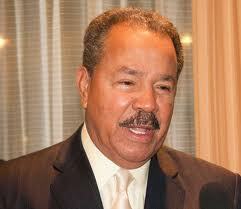 I think I’d like to visit with Juan Marichal. Don’t you just know he’d have some interesting and wonderful stories to tell? And I’d like to hear each and every one of them, but for now I’ll have to settle in and wait for another book. It’ll be worth the wait it I’m sure. Southern California is beautiful this time of year, and San Diego is no exception. This past week, for the first time ever, I finally made it to Petco Park and watched the San Diego Padres take on the Texas Rangers. Public transportation is great. Being from a smaller town I’m not used to having it, so when it’s available I take advantage. This time it was on the Coaster train from Oceanside to San Diego, and then a little jaunt over to the trolley, which practically rolled right into the park! 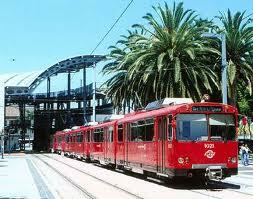 There was no charge for the trolley, which should be an incentive for game-day fans. Unfortunately, I ended up with two game tickets, but since I was by myself I kept the other ticket so I’d have room to set all my paraphernalia right next to me. I soon found out that wasn’t necessary. The seats in the entire row next to me, the row in front of me and the row behind me were practically empty, with the exception of a smidgen of patrons. This was a Wednesday game, 3:30 start time and the weather was beautiful. The park was beautiful. It’s just really sad to see all those empty seats in a ballpark. 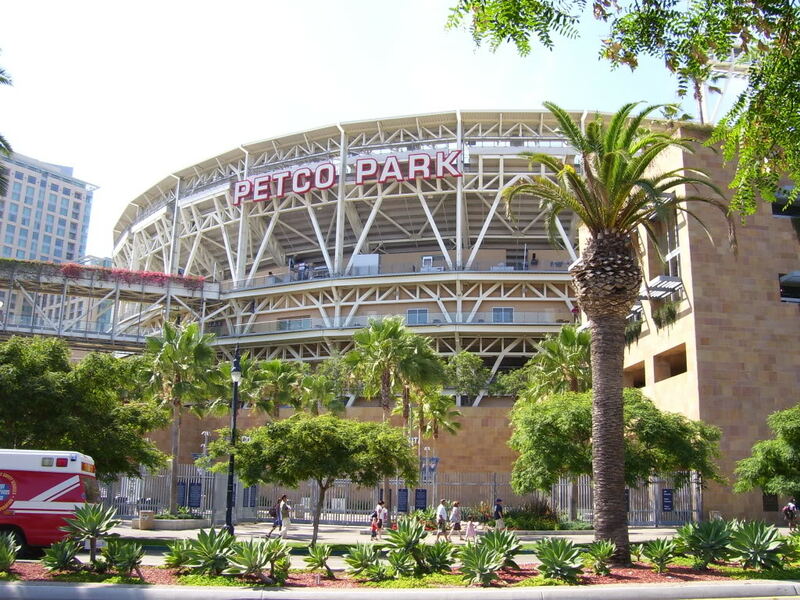 So I’m pondering why Petco Park and a lot of parks nationwide are having so much trouble getting the fans to attend. 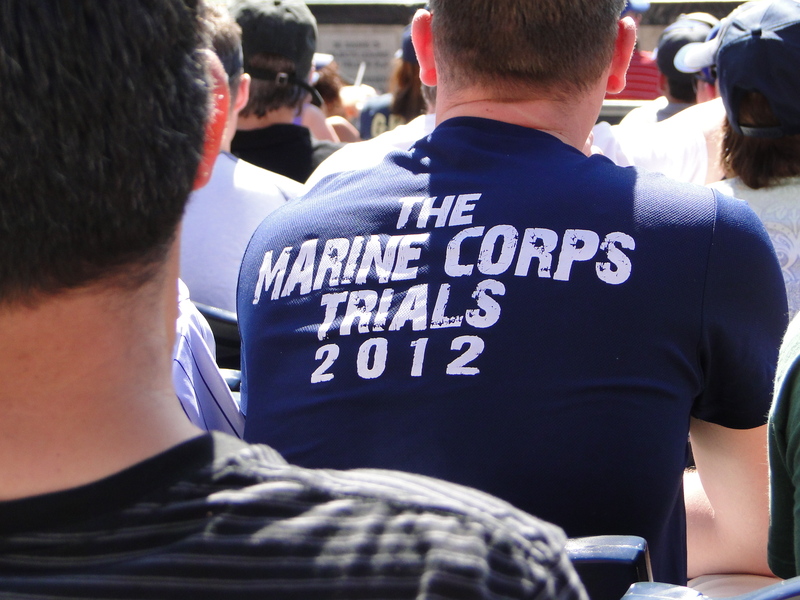 There was a large military presence at this particular game. I wondered if they had been comp’d and, if so, how much money the park is actually making or losing on each game. This is the 18Th ballpark I’ve visited and I’ve seen it before. And it doesn’t necessarily coincide with whether the team’s winning or not. 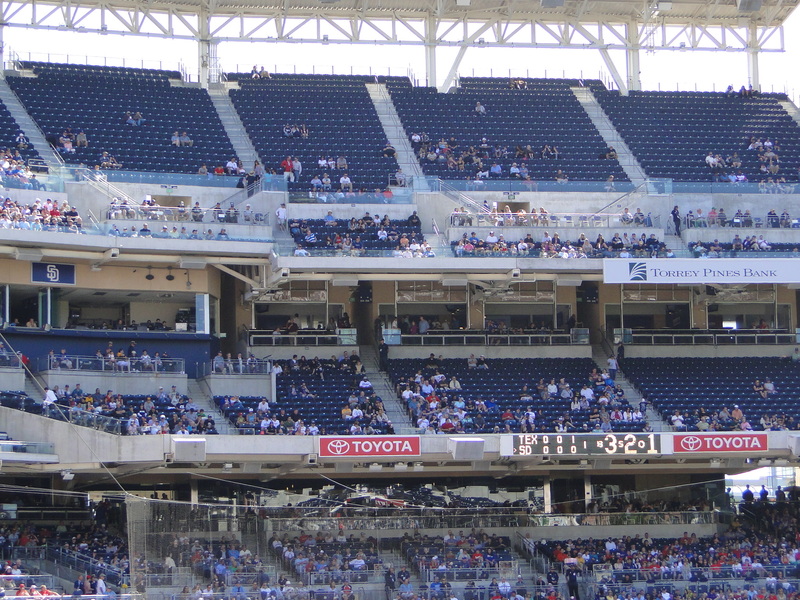 I remember back in 2010 the Padres had a really good team and lead the Division most of the year, but still weren’t able to fill the park. I really like Petco Park. I had the feeling I was on top of the action, no matter where the play was going on. 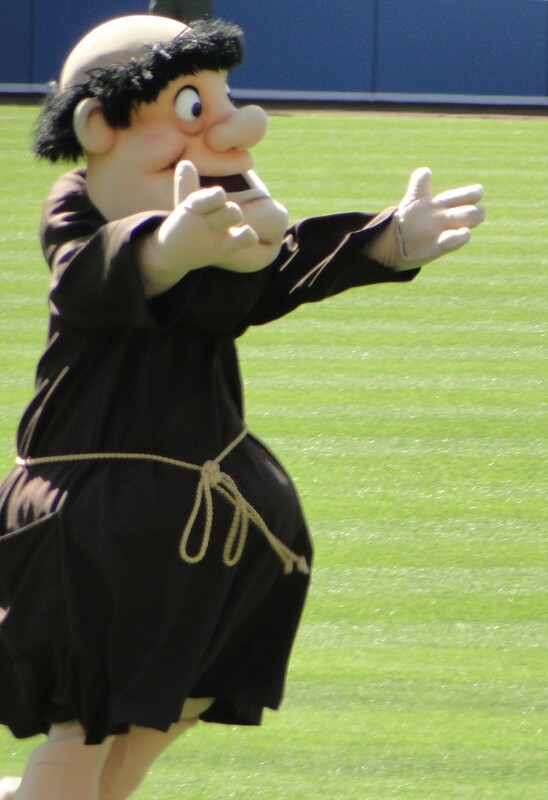 The Padre mascot paraded around the field in his traditional flowing garb and was totally entertaining. But I enjoy watching the game and one thing I found a little irritating was the great big field scoreboard so busy showing the fans and antics going on in the stands they rarely took time to show the stats of the game. This was much to the delight of the fans I might say, but when I’m busy taking lots of photographs, usually 100-125 each game, I sometimes lose track of the count, outs, innings. It would be nice to be kept in the loop on these things. At home with the telly this is never an issue. I’m usually keeping score anyway but for sure the game stats, box scores, etc., are usually there on the screen at regular intervals. About the game ~ the staff and fans at the ballpark were great. Great sportsmanship from both sides and the ones who were there, were knowledgeable and understood the game, always a plus. San Diego actually lead for a while. Yu Darvish, the Rangers’ pitcher, left the game a little earlier than he would have liked, and Josh Hamilton wasn’t able to smack one out of the park for a change, so it appeared that maybe the Padres might be able to pull this one out. But in the end the Texas Rangers who are having an amazing season (it’s the pesky World Series that gives them trouble) won the game. On the trip back to the condo, I couldn’t help but wonder what would happen to that beautiful ballpark if the owners were to sell and move the team to another city. It happens. What a waste that would be for the San Diego Padres fans. And I wondered, if the local fans knew this could happen, if they might be more inclined to show up for the games. Just wondering ….. a beautiful ballpark is a terrible thing to waste. Playoff game, two outs, I’m in left field. The best player in the whole Midget League is at the plate. Runners on second and third. If we get him out, we win. If he gets a hit, we lose. He swings and hits the ball so high it looks like a star. It starts coming down. Right at me. One of my earliest memories of my dad is him throwing me a baseball. We weren’t having a catch, exactly. I could catch the ball on my glove side, but not backhanded. There was a chain-link fence between our front yard and the kindergarten next door. My dad would throw again and again to my backhand side. I’d miss it, and it would roll to the fence. I’d go get it and throw it back. He’d throw it again. It would roll to the fence. Keith Olbermann Not Raining on This Parade! Keith Olbermann on David Letterman’s show …..thinking about his next blooper? Leave it to Keith Olbermann to try to rain on Cain’s parade. I say “try” because I’ve never really cared for him or his opinions as they rarely have relevance to anything, and I wouldn’t have read this one either, except that it got really personal. Personal, in that Matt Cain belongs to all of us fans here in the Bay Area and if you try to disparage him, you disparage us. But? But what? Truly unbelievable. Where do they get these guys? I mean where did they get” this” guy ~ real sports writers are starting to now proclaim that not only was this a perfect game, but that it just might be the best of all perfect games in the history of baseball. So what makes an under performing political commentator turned so-called sports writer feel a need to take a stance that’s so off the wall it kept me awake last night? Or am I just being overly protective of Matt Cain and the other Giants who continue to get no respect, even after this feat and the 2010 World Series triumph? Good grief. I can’t believe I’m wasting a half hour this morning talking about something Obie posted, as though something he writes has any relevance to anything, anytime, anywhere. In any event, take a look here and decide for yourself. “The Perfect Game Swarm”.